Nothing else than the European design of the PS-2100. The display of the PS-2100 consists of one line for alphanumeric characters and one line supporting only numbers. The PS-2400 packaged the same specifications in a conventional housing with a "qwerty" standard keyboard layout. The later PS-3010 combined the size of a credit card with a full keyboard. The related IS-2100 PhoneBook combines the PS-2100 with a small booklet. The featured PS-2100 Databank was manufactured in March 1993 by Nam Tai Electronics, Inc. in China. 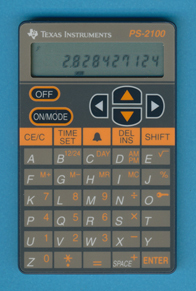 The PS-2100 traces back to the TI-2100 Pocket Info introduced in the year 1987. A blue edition of the PS-2100 was sold with the PS-9250 Data Bank Book while the PS-CARD probably never hit the shelves of the stores. How do you design such a small Databank ? This is an interesting question - the Databank is only 0.2 inches (5 mm) thick! This picture gives you the last time the working PS-2100 Databank. The next step will destroy it! Just after removal of the keyboard foil you'll notice the printed circuit board (PCB) of the PS-2100. The thin foil is one half of the switches, the PCB forms the other half. The later IS-8400 looks similar. The backside of the PCB gives you just a small blob of epoxy resin on top of the single-chip computer. It seems to be the TMP0620F known from the PS-2400. Find another chip-on-board design here. © Joerg Woerner, January 17, 2002. No reprints without written permission.